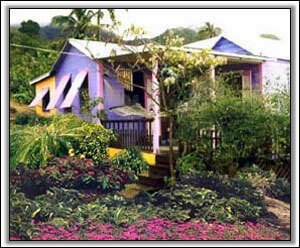 A charming Caribbean cottage nestled in the hills and painted in a bright color scheme. The interior is finished out with Mexican saltillo tile, wood plank floors and rattan furnishings with antique mahogany accents and decorated with an island flair. 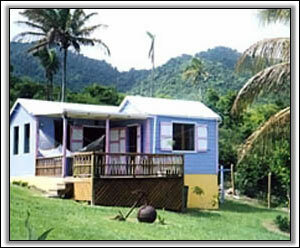 Located in Upper Webbe's Ground, Gingerland, on the Windward side of Nevis. 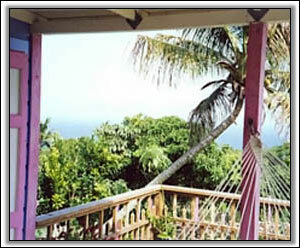 The cottage is four minutes from the main road and approximately 1,100 feet above sea level. Nights can be a bit chilly and a light sweater is recommended. Lay in the hammock and enjoy the cooling trade winds as well as panoramic views of the Atlantic Ocean, Nevis Peak, and the neighboring islands of Montserrat, Antigua, Barbuda and Redonda. If you're lucky you'll get to see wild Vervet monkeys scamper through the yard on their morning and evening outings. Come explore our tiny island steeped in history. Wander the old sugar mills, hike to the water source, or take in a day to deep sea fish. Stroll the old footpath from behind the house up to our water source, or along the Upper Round Road - not in use since the sugar plantation days. Play a round of golf on the Four Season's Championship Robert Trent Jones II golf course (reservations required) or play a game of tennis. Minutes away you'll find some of the oldest plantations on the island serving breakfast, lunch and dinner. 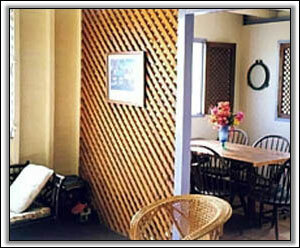 Numerous other Plantation Inns and local establishments are also nearby for your dining pleasure. For a less strenuous holiday, choose a book from our eclectic collection in the cottage and take in one of the many beaches available on the island.